The list of the nine finalist technologies of the 2nd edition of the UPM_innovatech 2T Challenge is now ready. A technology developed by the Grupo de Tratamiento de Imágenes "The human-Aware Spaces" is one of them!! Indoor location based services (ILBS) are a growing global market with a promising future. The applications are endless: human flow analytics, tracking, security, environment interaction, immersiveness, geofence, etc. to be applied in offices, museums, airports, railways, trade fairs, hospitals, hotels, shopping centers, industry, and more. 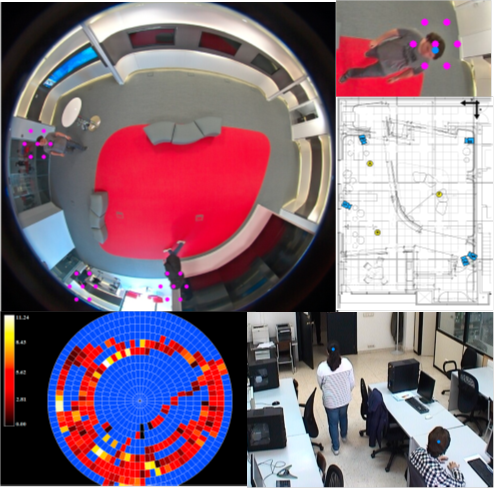 The Grupo de Tratamiento de Imágenes (GTI) has developed a novel indoor location technology based on deep learning and computer vision to sense humans without mobile phones or wearable sensors. True information is collected from people in indoors, unlike other existing solutions in the market, since no collaboration is required by people by using their mobile phones or wearing sensors for acquiring their location. The accuracy is higher or comparable to that achieved by the best sensor-on-human based indoor location technology. Our technology is supported by patents, scientific studies, and projects, such as the “Living lab demonstrator for the bank office of the future” for the Santander Group, ISBAN, and PRODUBAN.